This post is written by Ryan Lenzmeier, an MA student of History at NC State University. On the fifteenth of June 1762, an overwhelmed administrator in Northern France named C.M.J. D’Haffrengues published and distributed a letter meant to repress the “armed bands of smugglers who penetrate the kingdom daily.”  Within the letter, he gave extensive powers to royal and provincial troops throughout Flanders, France’s northernmost border and a major crossroads for the movement of illegal tobacco in the eighteenth century. Soldiers could quarter themselves in local homes, feed their horses from peasants’ food stores, and had no restriction on the methods utilized to capture smugglers. Once captured, “the offenders and disobeyers of the King’s Law must not await any grace or pity,” a statement that gave wide latitude for the agents of the crown. One hundred and three years and one day later, Donald Trump announced his intention to run for President of the United States. In his announcement speech, Trump made one claim that became one of the cornerstones of his eventual successful bid to become President. He said, “I would build a great wall, and nobody builds walls better than me, believe me, and I’ll build them very inexpensively, I will build a great, great wall on our southern border.”  At his recent rally in Phoenix, Arizona Trump reaffirmed the centrality of the wall’s construction to his presidency, saying “believe me. If we have to close down our government, we’re building that wall.”  For Trump and his administration, it seems that the southern border wall is a key piece of a broader security policy that seeks to gain control of the flow of people and products moving between the United States and Mexico. Of course, Trump is not the first person to suggest a wall as a solution to the problem of security. From Hadrian’s Wall millennia ago to the concrete outcroppings in Gaza, demarcation and exclusion seems to be a long-standing part of the human experience. Aside from the potentially obvious similarities between the two government officials’ statements, such as the desire to curtail the distribution of psychoactive substances or the yearning to demonstrate control over a given geographic area, Trump and D’Haffrengues betray one of the common problems of governance in the modern era: solving complex socio-economic problems with simple and forceful solutions. The General Farm was the administrative system in eighteenth century France responsible for tax collection and customs duties. To its administrators, smuggling was one of the pre-eminent issues of the age. Aside from cutting into their lucrative revenue streams, the crime of smuggling was understood to represent a threat to the entire kingdom of France because it undermined the authority and prestige of the French monarchy. D’Haffrengues’ letter was typical of the General Farm’s attempts to control the illegal importation of tobacco into France. By creating and enforcing punishments both for smugglers and those who aided smugglers, D’Haffrengues was proposing a simple and forceful solution to a complex problem. However, his solution ignored many of the circumstances that necessitated the solution in the first place: high markups of price as a result of the General Farm’s monopoly against the sustained demand for the addictive plant, or the fact that smuggling provided an easy way to earn extra capital in a mostly rural and cash-poor region. For many men and women in Northern France, smuggling was a way to provide for their families or to supply an addiction made unreasonably expensive by the interference of a governmental organization. It is therefore not surprising that the problem of tobacco smuggling and tax evasion remained a problem in French Flanders up until the French Revolution almost three decades later. Simply put, simply arresting smugglers does not alleviate the pressures of insufficient food supplies or economic opportunities that made smuggling so enticing in the first place. 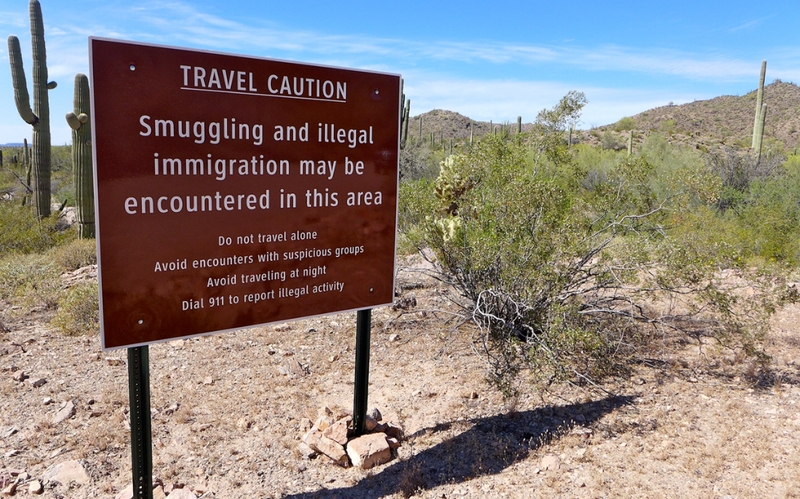 Similarly, the recent growth of Latin American immigration to the United States has been identified by many Americans with criminality and economic competition, and is seen as one of the central problems of the near future. But the intuition that a wall might solve these problems ignores the shifting structures of economic development and production that drive people and products across borders. The French parallel can be instructive here. The movement of tobacco in the eighteenth century across the Atlantic Ocean and into France challenged the General Farm’s entrenched tax collection and border control practices; D’Haffrengues and others representatives of the French crown responded to that challenge bluntly and violently. These actions did not halt the flow of illegal tobacco into France. The economic and social conditions that encouraged smuggling simply could not be solved through violent arrest. In our present moment, plans to build a wall do not have to deal with the complicated and continual issues of stimulating job growth on America’s southern border or addressing income inequality more broadly. Instead, the wall would be a brutal show of force that mainly serves to please Trump’s constituents. I do not intend to suggest here that I know the solutions to the complicated problems of immigration and drug usage in the United States. What I do want to suggest, however, is by looking at this earlier French example, we Americans might recognize the need to grapple with these problems that took decades to develop, and that will require careful policy to resolve. We must be wary of solutions that consist of one action or policy and purport to entirely address these problems. History demonstrates the futility of that form of solution. Shows of physical force, such as a wall or the militarization of tax collection forces, merely distract from attempts to address the true origins of complex societal issues. D’Haffrengues, C.M.J. Lettre Circulaire pour Prévenir les Maires et Échevins que Sa Majesté a Autorisé les les fermiers généraux à mettre sur pied des troupes de cavaliers habillés, armés et montés uniformément pour réprimer les bandes armées de contrebandiers qui pénètrent journellement. Lille, France : (15 June 1762. ): 1. Time Staff, “Here’s Donald Trump’s Presidential Announcement Speech.” Time.com http://time.com/3923128/donald-trump-announcement-speech/ (accessed 26 August 2017). Seipel, Brooke, “Trump Threatens to Shut Down Government to Build Wall.” TheHill.com. http://thehill.com/homenews/administration/347588-trump-threatens-to-shut-down-government-to-build-border-wall (accessed 26 August 2017).